The Itty Bitty Kitty Committee: And ANOTHER Name! Our dear friend Cynthia was the high-bidder on this little fellow's naming rights auction. She felt because of his tux and smoking jacket, he deserved something formal, so she selected "Cedric". Hello, Cedric. You ARE Cedric, aren't you. It's perfect. Once again, our namer hit the nail on the head. Nice work, Cynthia. And thank you so much your generous bid! Hello Cedric, you handsome creature! Your name suits you! Way to go Cynthia! Perfect! What a beautiful boy with magnificent whiskers! Fitingly formal but with a playful tone....well done Cynthia. Yes, the perfect name! And not only does little Cedric have such a lovely white chest, but his white chin is just TOO adorable. And, once again, thank you, Cynthia, for all you do for the Itty Bitties! Hello, Cedric! You're all dressed up for a formal introduction! Absolutely BRILLIANT! Cedric fits this little floofy tuxie to a "T." Thank you, Cynthia for lending us your perfect name-picking skills. Oh, I love this guy and I love this name! It is perfect. In fact, every kitten in the Gibson family has a purrfect name! Excellent name for this adorable bundle of kitten! 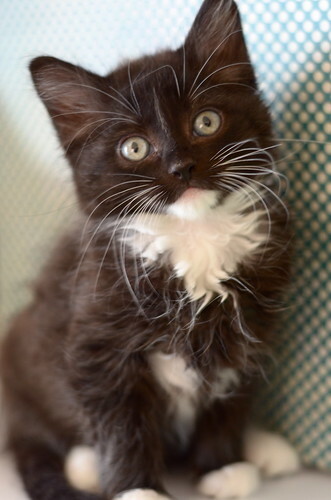 Cedric is a perfect name for a tuxie! I love it.